Top 5 Wheelchair Accessible Destinations in Italy! Home »Disabled Travel Newsletter »Top 5 Wheelchair Accessible Destinations in Italy! It is possible for travelers with limited mobility to experience and enjoy the very best of Italy, including its most famed cities and the beautiful, picturesque countryside. With an impressive variety of ancient sites, priceless art, delicious cuisine and fascinating history, Italy is a treat for anyone. 1. Rome: Rome is the third most popular city for tourists in Europe… and there’s a reason for it. It is a true haven for lovers of history, architecture and great food. While Rome disabled accessis not as good as other European cities, it is sufficient enough to ensure that an enjoyable accessible holiday is possible for people with limited mobility. I generally recommend at least 5 days in Rome (preferably 7) to truly capture the essence of the city. You can easily spend an entire day (or two half days) at the Vatican exploring St. Peter’s Basilica, the Sistine Chapel and the Vatican Museums. You will also want to visit the Roman Forum (note only parts of it is accessible), and of course the iconic Colosseum. While the gladiators had to use the stairs, disabled visitors here can use an elevator. 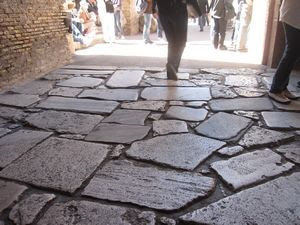 The biggest challenges for wheelchair access at Rome’s Colosseum are the areas with small of cobblestones that surround the outside of the Colosseum and a small stretch of cobblestones inside (pictured below). 2. Florence: Florence is a great city for disabled tourists to visit. The city has numerous things to see and do, and it is not nearly as hilly as Rome. Whether you visit for a day by train from Rome or choose to stay at an accessible Florence hotel for a few days, you’ll enjoy your time here.The tourist attractions in Florence are concentrated in the center of the city within walking/rolling distance of each other. This means that you won’t have to find accessible transportation to get around town. Another benefit to Florence is that the two most popular museums, the prominent Uffizi Gallery and the Accademia (home to Michelangelo’s David), provide free admission to disabled guests and one companion. 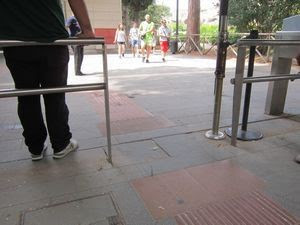 To avoid the steps at the Accademia, wheelchair users should use the ramp at the exit to enter. At the Uffizi Gallery, you will need to use the ramp on the northeast corner of the courtyard, closest end to the Palazzo Vecchio (pictured below). 3. Amalfi Coast and Pompeii: Visitors to the Amalfi Coast will be spoiled with magical hill towns and breathtaking views of the blue Mediterranean. Spend your time exploring the beautiful cities of Naples and Sorrento, enjoying an accessible cable car ride to Capri, and exploring the extraordinary ruins at Pompeii. Piazza del Plescibito. For Pompeii, I advise to book an accessible tour with a tour guide experienced in navigating the sites with disabled visitors. There is so much to see and do here, but knowing the accessible paths are key to a wonderful experience. 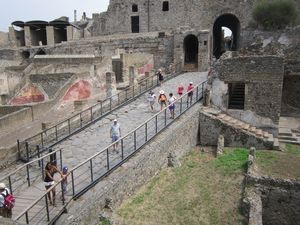 Normally, guests to Pompeii use the uphill entrance covered in enormous cobblestones. When you book your tour with us, your tour guide will use an accessible Pompeii entrance instead. 4. Venice: Hundreds of bridges in Venice can make for a difficult and challenging vacation. However, that doesn’t mean that disabled travelers need to avoid the city all together. In fact, over half of the city can easily be visited by wheelchair users without needing to step over any bridges. Several neighborhoods, including the one containing the famous St. Mark’s Square, St. Mark’s Basilica and Doge’s Palace, are accessible to disabled travelers with paths that avoid bridges and steps, and have very few cobblestones. Some of the Vaporetto boats in Venice are wheelchair accessible with ramps. 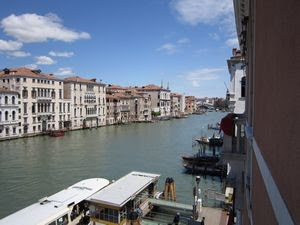 These are very useful for getting from neighborhood to neighborhood and for experiencing the Grand Canal which is one of the most popular places for tourists. 5. Tuscany: With its 1000-year old wineries, Italian cooking classes, and charming Renaissance and Medieval villages, Tuscany is a perfect place for a relaxing and memorable getaway. 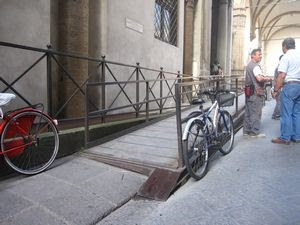 Tuscan disabled access presents different challenges such as plenty of hills, inaccessible buildings and cobblestones but don’t let that discourage you. With the right planning you will have an enjoyable time here. To avoid the major accessibility challenges in Tuscany, our accessible trip planners are ready to assist you with everything from your accessible accommodation to guided tours with experienced tour guides who are familiar with all the accessibility features of the Tuscan cities and venues. Enjoy an Accessible Food Tour in Siena, experience an Accessible Private Sightseeing Flight over Tuscany, visit the charming cities of Accessible Tuscany Guided Tour of Montepulciano and Pienza and how about an Accessible Driving Tour of Chianti Wineries and Villages? 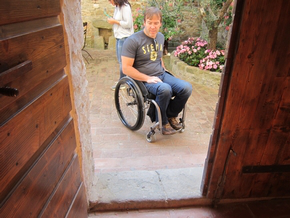 Most wineries are not wheelchair accessible and can have one or more steps at the entrance. We’ve inspected several and our tours include fully accessible winery visits – without stairs! We can book accessible train seats plus assistance to get on and off the train so you can comfortably enjoy the scenic rides between cities!